This is the other Land Cruiser we hired on a slow descent from a near-90degrees slope. The track on the left side was our Land Cruiser's tracks which descended previously. If you ever get the chance to go to Arabia - whether it's in Dubai, Qatar, Saudi...etc. the one that should be on top of your list to do is dune bashing. It's an experience like no other. My wife and I after 5 minutes into the desert. We stopped a while for souvenir photos. We did just that quite soon enough after our first arrival here in Qatar. There were 11 of us on the trip which is just enought to fill up two Toyota Land Cruisers. We hired them from a local tour operator called Arabian Adventures with drivers included. I'm sure it would be more fun to do the driving yourself but if you don't have the training and experience, it would be better to leave the driving to the experts for your own safety. Arabian tent and barbecue are included in the package. It was far better than any rollercoaster ride I have ever been on. With 4x4, there is more sense of danger because you don't have safety restraints and wheels on tracks. The car could flip anytime. And because there are no tracks, the ride is unpredictable. 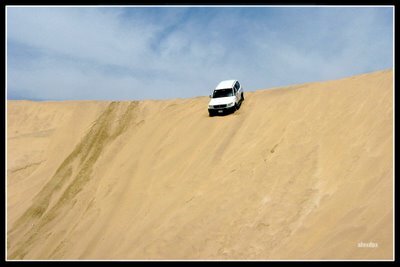 There was one time when our driver approached a dune edge. He slowed down - just a bit - and I thought we're stopping for pictorials. But to everyone's surprise he just went on down to the "cliff" and drove down with the slope at near-90 degrees vertical. On another ocassion, he drove on a slope and the car was almost sideways. There was also one time when we stopped at a steep slope. Then, our car descended slowly and it was frightening because were face down to the ground below. Then as we reached the bottom of the slope, the other car descended the same way but hanged on for a while then just before it reached the bottom, the driver revved up and there was a big spray of sand around the Land Cruiser. Spectacular! Toyota Land Cruiser with 4.5L V8 engine. The sand dunes are even more a sight to behold at sunset. A word of caution. If you have motion sickness or heart disease, you should not try this activity. The contents of this blog is an account of a personal experience and is not in anyway a promotion of of this activity. Try this activity at your own risk. 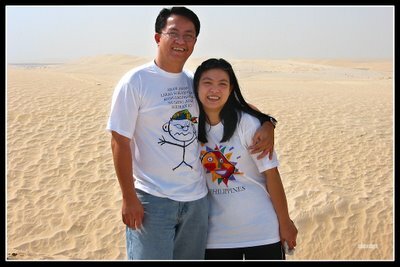 I actually came about your blog from looking for info on visiting the Inland Sea in the south of Qatar. I haven't been able to find much information and am hoping you'll be able to help. I'm actually transiting through Doha for just one night. I get there at 8pm and was thinking about hiring a 4x4 to camp in the desert. 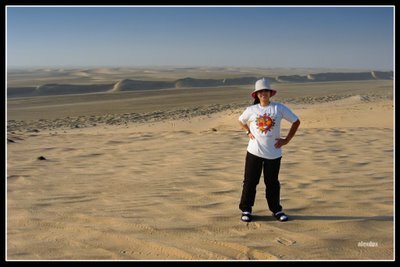 I was told that I should extend my stay for at least another day and that it isn't advisable for an inexperience desert driver to go alone to the dunes. If you can provide any sort of information about distance and time required to visit the Inland Sea, I would highly appreciate it. If not, enjoy your stay in Doha. Desert Safari is definitely a once in a lifetime experience. I went to Doha on a work trip. and they didn't warned me about the motion sickness. Then halfway through the journey, my body started to challenges me. the rest is history. Never in my life, i experienced such a bad case of motion sickness. However, I never regret went to this adventures journey. If I have another chance, I will go again. But this time, I'll be prepare. 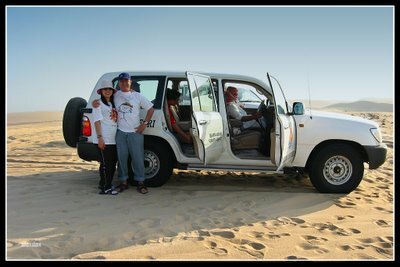 Dune bashing is little adventure because 4*4 drivers are so experienced but it is a great fun and enjoying o your life.